The Southern Highlands Participatory Organization (SHIPO) is a Tanzanian Non-Governmental Organisation based in Njombe, Tanzania. My role at SHIPO was to coordinate the SMART Training Centre, together with a local Young Expert Eugenia Kimaro. SMART stands for Sustainable, Marketable, Affordable, Reliable Technologies. 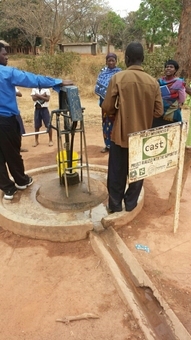 The SMART Centre trains local entrepreneurs but also international NGO’s in a variety of low cost technologies, such as rope pump production, well drilling, groundwater recharge systems and drip irrigation systems. As a coordinator I was responsible for the organisation, funding, planning, and guidance of the trainings. For more information, visit the SMART Centre website. My tasks related to the implementation of SMART Info include training employees, developing monitoring strategies, data quality analysis and improving the system. Reducing non-revenue water in Accra, Ghana via Vitens Evides International (2007). During this internship I have set up a project that contributes to the decrease in non-revenue water in Accra. Via fieldwork we (the project team) collected and analyzed coordinates of connected customers of the Ghana Water Company Limited (GWCL). I then transferred the tasks to local employees and led the project and the project team. Research project in South Africa and Zambia via Delft University (2010). A new method for measuring temperature was developed and I tested the method in both laboratory conditions as well as in the African field conditions. The research was part of the Trans-African Hydro-Meteorological Observatory (TAHMO) project. Process manager at the water board of Rijnland, Leiden (2012-2014). As a process manager I was responsible for the progress of various projects, such as the urban water plans for various municipalities. My daily activities consisted of organizing internal and external progress meetings, project planning and organizing field visits. As a participant of the Nationaal Watertraineeship (2012-2014) I worked in four multidisciplinary project teams on water related topics. For example I was a participant of the Wetskills programme in Mozambique (2013). In this event 20 contestants from the Netherlands and Mozambique have worked on local water issues concerning drinking water, irrigation, sanitation and the building of a new dam. The results of these cases have been presented to the audience with the use of pitches and posters, during the official launch of the Mozambican Water Partnership (PLAMA).